We consider no job too specialized or too small. 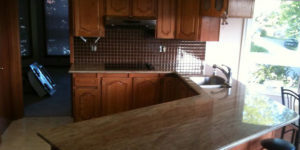 We specialize in professional design and installation of stone-based counter tops. 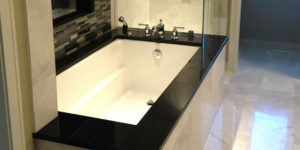 Granite, marble and quartz are all available for residential applications. You’ll be amazed at the difference that new counters will make in your kitchen! Increase your home value and enjoy our worry-free peace of mind installation guarantee. It’s amazing what a new vanity counter can bring to a bathroom. 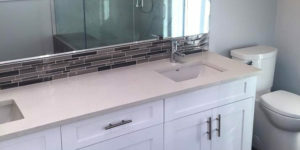 Whether it’s for a whole-room reno or you’re just looking for a countertop refresh, vanity counters are an ideal way to accent any bathroom upgrade. It’s not just tile that can accent a fireplace. Natural stone is an ideal accent choice and you will enjoy the custom selection process in our giant warehouse facility. A counter that does not fit perfectly will do you no good. To ensure 100% accuracy, we laser mark and measure all surfaces prior to fabrication. We obtain exact measurements using digital LT 55 Laser. The digital machine LT 55 Laser draws the kitchen layout or the size/shape of the cabinet for the countertops and detects exact wall angles to allow your new counters to fit the wall perfectly. The laser can also customize shape e.g. round or anything that customer prepared for the design of there countertops. Once you have selected your slab and we have completed the in-home laser measurements, our production shop uses 3D laser projection to project the shape of your counters onto the slab that you have selected. This allows you to see the design of the stone, where it will be cut and even the joints or seams for any customize design requirements. Once you approve the laser-guided layout, we begin the CNC cutting process and will book a date for your install. First, a Bridge saw is used to cut the stone using the diamond blade. 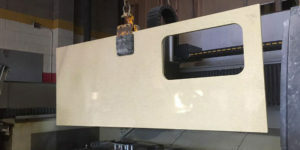 We then move to the CNC router Intermac machine that produce a beautiful crisp edge and sink cut out. We use diamond tools to cut faucet holes on-site for a perfect finish. 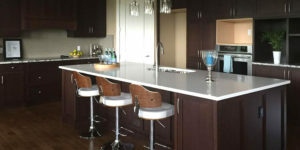 We will deliver and install your counters on the same day. During install we use high quality, low odour adhesive and a vacuum pump seam puller on all joints to ensure a perfect fit and to level the surface of the stone.